Even when the Home Inspector is on vacation in the Mayan Riviera, he's checking things out. 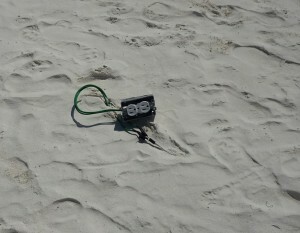 Here is an example of a public beach electrical system. About half way from the edge of the jungle to the water I came across this electrical outlet in the sand. Who knows what the code is in his particular area of the Yucatan Peninsula!